At Powershop, we think the way energy is generated, how it travels to our homes and how we pay for it, is going to change dramatically in our lifetime. One already noticeable change is the amount of rooftop solar popping up all over our neighbourhoods. This got us thinking… what about those of us who rent or live in apartments and don’t have the choice to benefit from solar generation, or those of us who simply cannot afford to install it? Is there a way for us to show how much we support the growth of solar power in Australia? That’s why, after our overwhelmingly successful trial – and now by popular demand in time for summer – we’re making this Powerpack —Your Neighbourhood Solar — available to most of our customers. 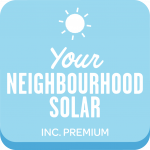 Choosing this pack is your chance to support those in your neighbourhood who have solar installed and are exporting that energy to the grid. This new take on peer-to-peer trading is a Powerpack that includes a 4.4c/kWh (incl. GST determined at time of purchase) premium that will be redistributed to Powershop solar customers with a smart meter and on a standard feed-in tariff in your distribution area. 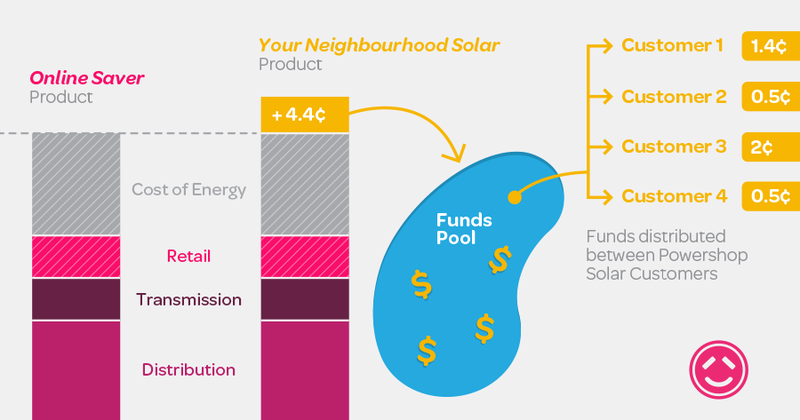 For those who prefer visuals, this might help: How do Powershop solar customers benefit? The 4.4c/kWh (incl. GST) premium (determined at time of purchase) that is included in Your Neighbourhood Solar is pooled together and redistributed to your ‘neighbours’, being all Powershop solar customers with a smart meter on the standard feed-in tariff in your distribution area. This means they will receive an even higher feed-in tariff for the solar they export to the grid (none of the premium is retained by Powershop). So you’ll not only be helping to reward people for their investment in solar, but you’ll also show there’s a demand for it. While the special is available to all our customers (subject to availability), redistribution of the premiums only works for solar customers with a smart meter. Smart meters allow you to have more control over your electricity usage and help you understand the best time to use power and maximise the value of your solar. If you’d like a smart meter for no up front cost, you’ve come to the right place –click here! This is your chance to support your neighbours with solar and to encourage other neighbours to contribute to the small-scale renewable mix in Australia by installing solar panels. Your ‘neighbours’ will receive a share of the total premium collected (less GST), based on how much energy they export to the grid. Powershop will not retain any of the premium. We hope that the product will help to send a message to homeowners that solar can reward households who have installed it.This is your chance to pay it forward to your solar-loving neighbours, by increasing the return on solar and hopefully encouraging stronger uptake in solar installations. Please do! GreenPower is a government-managed scheme that enables Australian households and businesses to displace their electricity usage with certified renewable energy, which is added to the grid on their behalf. By purchasing GreenPower, you are helping to support demand for large-scale renewable energy in Australia. At Powershop, you can buy as much or as little GreenPower as you like (read more about how here). You can buy it in parallel with Your Neighbourhood Solar – the choice is yours! make a first step towards what might be energy trading of the future. You will see this special in your shop from 5 November 2017 and the choice is yours if you want to snap it up! The offer will be available until 30 November 2017 unless sold out prior to this time.